Every decade or two we need to lie down our flagpole so it can be rejuvenated. That's happened in the last few ends.To celebrate and add to our Opening on Saturday, June 7, Commodore Walmsley will preside over the Official raising of the Club burgee at noon on the 7th.Just another fun way to enjoy our 108 year old Club. KYC has also launched its new summer beverage menu, featuring old favourites and new options for wine, cocktails and beers. As a result of the success of Beau's feBrewery promotion KYC is now carrying some of Beau's seasonal beers by the bottle. next time you are at the Club. Also new this week is Malivoire's Small Lot Gamay, a red wine in the Beaujolais style from Niagara. The Small Lot Gamay is Light to Medium bodied, refreshing with notes of cranberry and cassis and will be served slightly chilled. Stay tuned for new beer and wine selections as they become available. KYC will be serving brunch from 10:30am until 3:00pm on Saturday & Sunday. Saturday Brunch will feature the same delicious breakfast and Lunch menu items as Sunday Brunch, along with daily specials. At 3:00pm, following brunch on both Saturday and Sunday the regular patio menu will be offered for the rest of the day. JS Fundraiser - Thank you for your Support! Many thanks to Diane Reid for her inspirational talk at KYC. 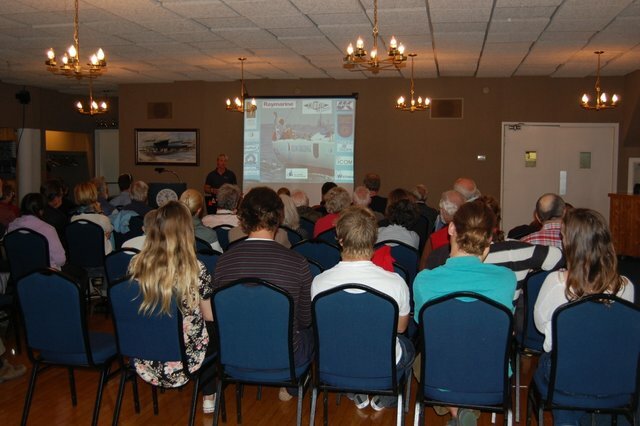 Over 50 people listened in awe to Diane’s exciting Mini Transat adventures.Cheers also to all of who bid (as well as donated items for) the silent auction items. Together with your support we raised over $1,000 for the Junior Sailing Race Team program. If you have a PHRF certificate and have not yet had your spinnaker measured please visit the Partridge Room on June 3rd or June 5th after racing to be measured. Join us at KYC to learn about John’s new destination for this July. Meet new cruisers or greet old friends. KYC is joining the Ontario Sailing initiative "getintosailing.ca" which will open our doors to the community on June 21. We are looking for Skippers to help out by volunteering their time and boats to take out members of the Kingston community who are interested in the sport of sailing. We will also have the Junior Sailing boats and Able Sail fleet available for interested participants. More details to come. Mark your calendar!